Videos and multiple reports making rounds on social media have revealed that Pastor Paul Adefarasin's House of Rock in Abuja is currently on fire. 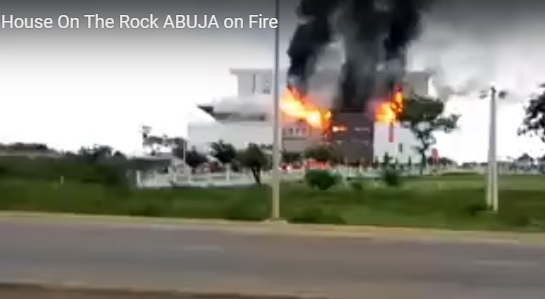 The House on the Rock Church in Abuja is currently on fire. The church which is founded by Pastor Paul Adefarasin, is one of the foremost Pentecostal Ministries in Nigeria with branches across the country and beyond. It is not yet clear what caused the inferno, but the church building, located at airport road Abuja, is being consumed by the fire which appeared to have started Sunday afternoon after worshippers had vacated the premises. Firefighters in the Federal Capital Territory are yet to arrive at the scene as at the time of filing this report, with passersby helplessly watching on. Watch the video of the fire below.